I have this dilemma months ago. I have Chico and Delamar's podcast in my iPhone and it was already marked as watched. Even I have synced it in my iTunes, still it was showing in my iPhone. Annoying right? I researched again on what to do. I think there was a glitch with the syncing. Anyway, what you can do is to manually delete it in your iPhone. 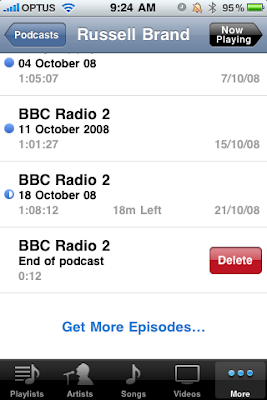 At your podcast list, select which item to delete. To delete just strike your finger in a horizontal manner. If you this correctly, the delete button will appear. Just click it and it is finally erased. This technique is also applicable in deleting movies and tv shows. Easy right?